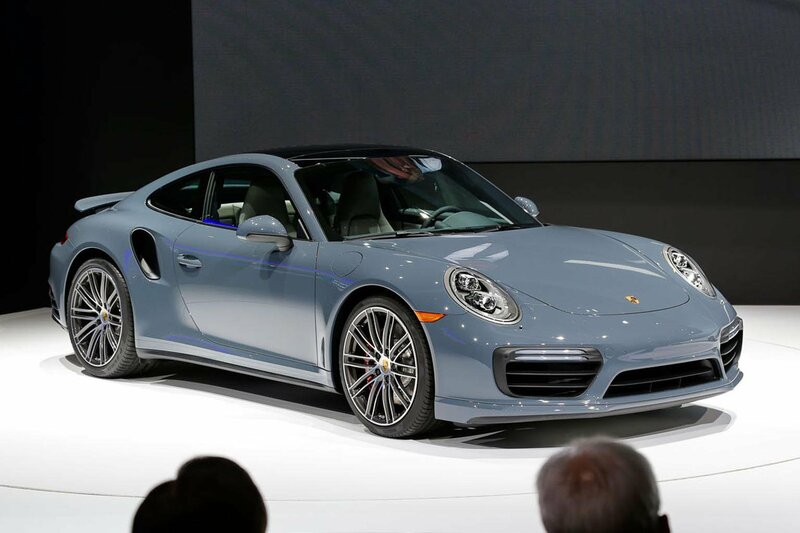 2016 Porsche 911 Turbo and Turbo S unveiled | What Car? The facelifted Porsche 911 Turbo and Turbo S have been revealed, and have received their first public at the Detroit motor show. Porsche's 911 Turbo and Turbo S receive a host of upgrades for the 2016 model year. In line with the facelifted 911 Carrera and Carrera S, the Turbo variants receive a number of styling changes - including a new front bumper with a revised splitter and modified LED indicators. New 20-inch alloy wheels also feature. Key among the changes are modifications to the twin-turbocharged 3.8-litre flat six engine that's fitted to both the Turbo and the Turbo S. The Turbo S receives 20bhp more than before, at 572bhp, while torque remains the same as before at 553lb ft. The 911 Turbo, meanwhile, gets 532bhp. The 911 Turbo can reach 62mph from a standing start in 3.0 seconds, and reach a top speed of 199mph. The 911 Turbo S manages the same sprint in 2.9 seconds, and has a top speed of more than 200mph. Along with its performance gains, Porsche has also improved the fuel economy of both models - with coupé variants now returning 31.0mph and cabriolet versions returning 30.4mpg. How much equipment does it come with? Both the 911 Turbo and Turbo S receive a new, larger steering wheel and a new touch-sensitive infotainment screen. New options include a radar-based lane-changing system and a lift function that raises the front spoiler by up to 40mm, allowing the model to deal with large speed bumps. Both cars are already on sale in the UK in both coupé and cabriolet forms. Prices for the 911 Turbo start at £126,925 for the coupé, with the 911 Turbo cabriolet priced at £135,766. The 911 Turbo S coupé starts at £145,773, and the Turbo S cabriolet is priced from £154,614. The 911 Turbo and Turbo S face plenty of competition in the sport coupé market, particularly from the likes of Audi's R8 and the Jaguar F-Type R. We recently tested the 2015 Audi R8 in the UK, awarding the 602bhp Plus version a four-star rating. Jaguar's F-Type R meanwhile, currently holds a four-star rating on What Car?.